Flyers' goalie Carter Hart (left) and Travis Sanheim after Montreal's Shea Weber scored a goal during the second period on Tuesday. For the Flyers, the “Year of the Eight Goalies” is not ending the way they had hoped. For more than two late-season months, they were one of the NHL’s best teams, but they have faded down the stretch, losing for the third time in four games Tuesday – a devastating 3-1 defeat to Montreal at the Wells Fargo Center. Rookie goalie Carter Hart (33 saves on 35 shots) again played well, but his teammates, slowed by sloppy passing in the first two periods, didn’t generate enough quality chances against goalie Carey Price (32 saves) and one of the teams they are chasing. Max Domi iced the win as he beat Radko Gudas (five hits, four shots) to the puck and scored an empty-net goal with 65 seconds remaining. The Flyers, who have nine games left, remained six points behind Columbus for the final playoff spot. Columbus, which lost Tuesday in Calgary, is one point ahead of Montreal. Couturier lifted the puck past Price on a rebound to get the Flyers within 2-1 with 11 minutes, 18 seconds left in regulation. It was Couturier’s 30th goal and it snapped the Flyers’ 0-for-17 power-play drought that had lasted seven games. About 5 1/2 minutes earlier, Shayne Gostisbehere’s wrist shot from the point caromed off the right post. Until their flurry on the game’s first power play, the Flyers had little sustained pressure on Price. They applied pressure after Couturier’s goal but couldn’t score the equalizer. Earlier, with Hart screened by Andrew Shaw, defenseman Shea Weber scored on a point drive with 15:15 left in the second to give the Canadiens a 2-0 lead. Weber’s goal marked the 26th time the Flyers had faced a 2-0 deficit this season. They have won just three of those games. 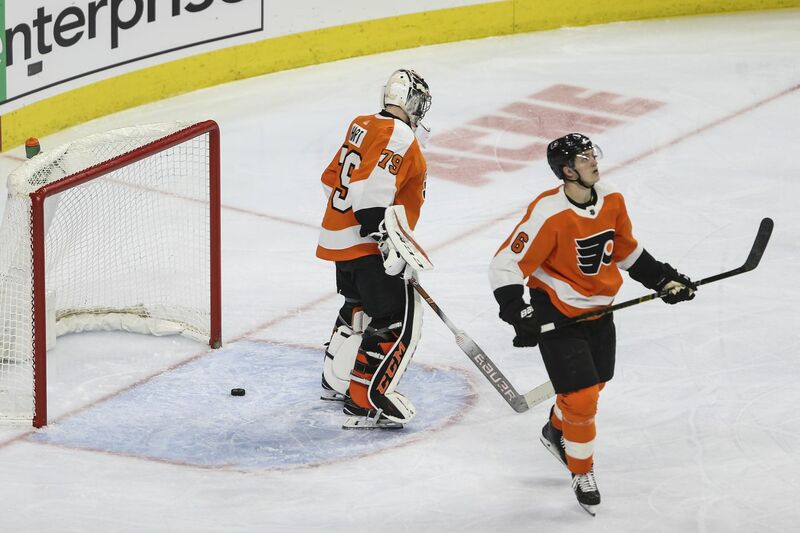 On Sunday, the Flyers used a late rally to stun the Penguins in Pittsburgh, 2-1, in overtime. But they didn’t carry the momentum into this game and were flat in the opening period. Montreal had many Grade-A chances in a first period, during which it took a 1-0 lead by capitalizing on Oskar Lindblom’s turnover. Brendan Gallagher, who had a hat trick in the Habs’ 5-1 win over the Flyers on Feb. 21, took the puck away from Lindblom and then scored from the high slot after gathering a rebound. The original shot was taken by former Flyers defenseman Christian Folin. The Flyers have been outscored by a 75-56 margin this season in the first period, by far their worst stanza. Price hardly had to work up a sweat in the first half of the game as most of the Flyers’ shots were from the perimeter. In the latter stages of the second period, the Flyers finally got a couple of decent chances on Price, who stopped Gostisbehere and Ryan Hartman from in close. Generally, though, the Flyers played a dump-and-chase game in the first 40 minutes. Journey’s “Don’t Stop Believin’ ” was played through the Wells Fargo Center speakers between the second and third periods, but the Fan Appreciation Night crowd had little belief after the Flyers lost to a team that had dropped four of its previous five and had scored a total of eight goals in those games. “We can’t afford losing a game the rest of the season,” Giroux said.